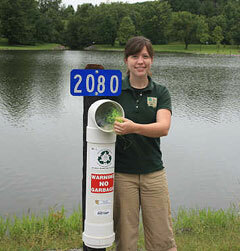 A student at Upper Iowa University in Fayette turned a vacation observation into an award-winning conservation program. Tamra Lewis, a junior from Iowa City was vacationing in Florida when she noticed a container where fishermen could get rid of old fishing line. Lewis, a conservation management major, thought it was an idea that could be used along the lakes and rivers in Iowa — as discarded fishing line can take hundreds of years to break down, and poses a danger to animals who get caught in it. Lewis says she wasn’t sure if the containers used in Florida would work in Iowa because of the snow and the different "critters" that might get into them. So, Lewis searched out the administrators of the Florida program to get more information. She brought that idea back to Iowa and an internship with the Johnson County Conservation Board. They sought donations of the p-v-c pipe and built some of the containers. She says as the started looking for donations, they figured out they could use the four inch p-v-c pipe instead of the six inch, and that cut the cost of the containers from about 75 dollars a receptacle to 15 dollars. Lewis says once they built the containers, they put them out without any publicity, and they soon found the anglers were taking the bait. Lewis says every single one of the receptacles had fishing line in them. Lewis says it’s a great way to keep Iowa’s fishing spots clean. Lewis says she often sees line washed up on the rocks of shore, and people who want to clean that up or their own line can now do so. Lewis says the fishing line is collected and taken to the Berkley Conservation Company in Spirit Lake, where it is melted down and recycled into things such as tackle boxes and flash lights. She’s excited that the idea has taken off as more and more conservation officials in Iowa look at it. Lewis says it’s a great way for anglers to clean up and protect their own fishing spots. The idea kept spreading with more and more counties taking interest and Lewis eventually won the 2007 Iowa State Association of Counties Individual Excellence in Action Award. Lewis says the Iowa DNR is looking at using the program, and the Michigan DNR has also talked to her about it. The program is also being considered for a National Association of Counties Award.